In a small gallery on a quiet residential street near King’s Cross, a piece of uranium ore and a sample of mining waste containing potentially hazardous heavy metals sit alongside the screens, projectors and vitrines we might usually expect to find in a gallery of contemporary art. Both form part of Conflict Minerals, an exhibition and series of workshops and discussions examining the interwoven threads of resource extraction, environmental degradation, colonialism and capitalism in the twenty-first century. Commissioned by Arts Catalyst in combination with Goldsmiths College as part of their ongoing Nuclear Culture research programme, Lise Autogena and Joshua Portway’s film Kuannersuit; Kvanefjeld examines the prospect of open-pit mining in Greenland. Kvanefjeld Mountain, the site of vast deposits of rare minerals and uranium, towers over the small, mostly indigenous community of Narsaq. Kuannersuit; Kvanefjeld follows the dispute as to whether its vast mineral and rare earth deposits should be extracted, interspersing beautiful shots of Greenland’s mountains, valleys and glaciers with interviews with members of the community. Refusing any kind of simplistic or conservative notion of conservation, Autogena and Portway convey the complexity of the debates surrounding the proposed mine. For many in Narsaq, the exploitation of Greenland’s uranium and mineral reserves is the only realistic route to an independent, decolonised future first articulated in its anti-colonial movement of the 1960s (the country is still an ‘autonomous administrative division’ of Denmark). The decline and loss of the fishing industry in the 1970s and 80s had a lasting effect on this project; interviewed in front of empty, boarded-up residential blocks, one resident laments the loss of the fleets that once set sail from Narsaq, and suggests that the mine would bring jobs and prosperity back to the community. Those that support the mine do so, for the most part, ambivalently. Many are well aware of its likely effects on Narsaq and the local environment. They are also aware, though, of a grim inevitability: the world’s voracious appetite for resources will not allow their mountain to be left untouched for much longer. The sample of uranium ore extracted from the mountain lurks at the back of the room, tightly sealed (I hope) in a small, transparent plastic cube. With the lights down low this unassuming grey rock blends in with the grey walls of the gallery, yet it still serves as a valuable reminder that this material is just that: material . Those that dwell in the Global North are used to certain forms of pollution or dangerous matter, but our knowledge of others is still largely abstract, mediated by popular culture as much as science and technology. 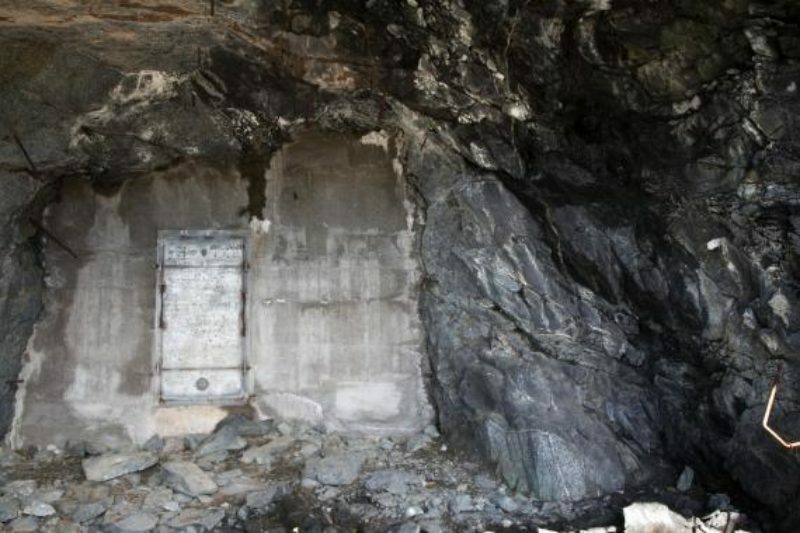 This sample was removed before the initial, relatively small-scale mine cut into the side of Kvanefjeld was closed and sealed in the 1980s. One of the film’s closing shots lingers on the heavy metal door at the entrance to the mine that will, soon, be cast open once more, juxtaposing it with shots of the uneven surface of one of Greenland’s few remaining glaciers (many have been lost as a result of our planet’s rapidly rising temperatures), and of a young child wandering alone through a landscape that might look very different in decades to come. If Autogena and Portway’s work captures some fleeting, final moments of calm before the storm of dust and pollution that attends open-cast mining, then Nabil Ahmed’s Inter-Pacific Ring Tribunal (INTERPRT) provides a detailed, multimedia record of a long, ongoing conflict around the extractive industries at work in West Papua. An open collective of artists, lawyers, scientists, architects and political organisations, Ahmed’s project is also a methodological examination of the intersections of artistic and activist practices, and the role of the aesthetic in trying to track and make manifest the industrial, corporate and state practices that are integral to the maintenance and furthering of ‘extractive capitalism’. 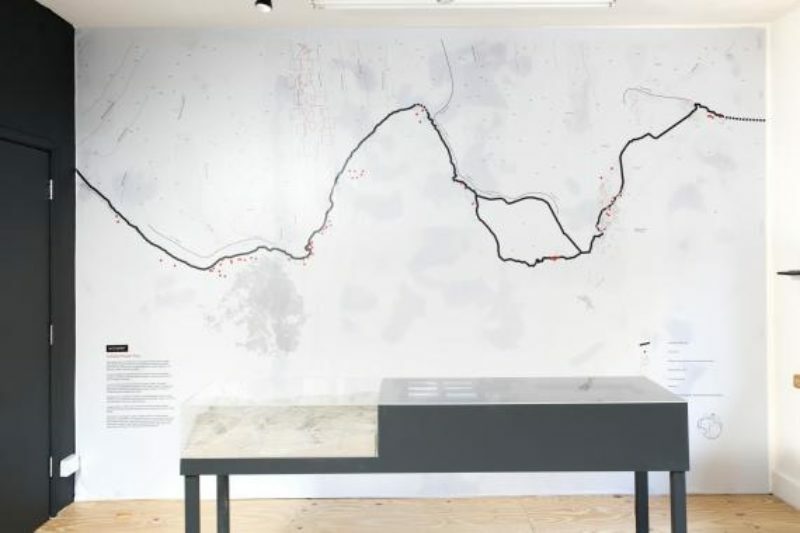 A combination of a short film and annotated maps, diagrams and timelines, the group’s ‘spatial evidence traces both the environmental damage caused by the dumping of toxic materials from the vast Grasberg Mine and the forced displacement of indigenous populations in the local area. 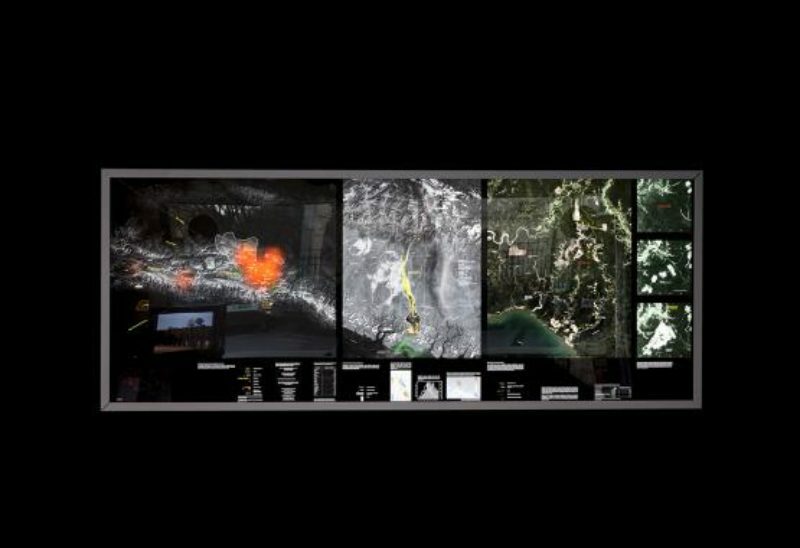 A cartography of loss and damage, these works constitute part of an ongoing inquiry into whether Freeport, the company that owns the mine, could be tried for ‘ecocide’, the deliberate destruction of an environment. As the short film ‘In the stomach of the dragon’ chronicles, this aim builds on indigenous activist and West Papuan leader Tom Benal’s efforts in the mid-1990s to bring a lawsuit for environmental damage against Freeport in an American court, a project that also highlighted the province’s fight for self-determination. Benal’s efforts were ultimately unsuccessful, but they did serve to shed light on the links Freeport had developed with the Indonesian government (which assumed control of the province from the Dutch in the 1960s), through which military power safeguards the profits of a multinational corporation over the political autonomy and physical health of local populations. Similarly, the World Bank’s role in abetting the removal of the Angunngme and other indigenous populations from the area around the mine by funding an extensive ‘transmigration programme’, highlighted in this exhibition, is exemplary of the connections between economic, corporate and state actors. As INTERPRT show, conflict, capital and labour exploitation are at the heart of the twenty-first imperialism of the Global North, its monopolisation of resources and its externalisation of risk to the bodies of those least able to oppose its reach. In their focus on resource extraction and its short and long-term effects, both works can be framed by the concept of the Anthropocene, the influential thesis that humanity should now be considered as a geological and telluric force. Yet by engaging with the possibility of establishing a planetary or geological commons, and by delving into the specific conditions of mining in certain parts of the world, both works also signal some of the criticisms of the Anthropocene in terms of its limited political and historical dimensions. By framing climate change and its attendant environmental degradation as a result of some kind of innate human trait, rather than the result of particular political and social struggles through time, the concept risks distributing responsibility for global warming and environmental degradation evenly across the world’s population. This won’t do—the inhabitants of the earth are not equally responsible for the current ecological crisis, either in the present or through history. A number of theorists and historians have therefore called for a more nuanced, less Eurocentric account of the Anthropocene. In this vein, some have argued that we might more accurately describe our current age as the Capitalocene, the age of capital and profit at any cost, rather than the ‘age of man’ (a thesis with which I find myself in agreement, not least because it foregrounds asymmetries of wealth and the unequal ecological exchange between the Global North and South as foundational to the former’s prosperity since the fifteenth century broadly and the post-war period in particular). Arts Catalyst’s central aim is to commission and support artwork that critically and imaginatively engages with science and politics, a project that seems even more urgent today than it was when the organisation was founded in the mid 1990s. As works-in-progress, evolving practices that are collaborative and open-ended (though to differing degrees), both Kuannersuit; Kvanefjeld and INTERPRT provide some useful answers to a question at the heart of T. J. Demos’s recent book Decolonizing Nature (2016) about the relationship between art, science and political ecology: ‘what role exists for artists and activists, increasingly brought together under [the] emergency conditions’ of the present ? Once you cut off your braid, where do you reattach it?